Like the departed intergalactic bandleader Sun Ra—to whom the second side of this LP, a five-part, half-hour-long piece titled “Shadow of the Sun Suite,” is dedicated—Joe McPhee was obviously sent to us from the most supernatural part of the universe. How else to explain the eternal creativity and unwavering flightpath of the saxophone giant, who turned 79 (Earth years) last month? 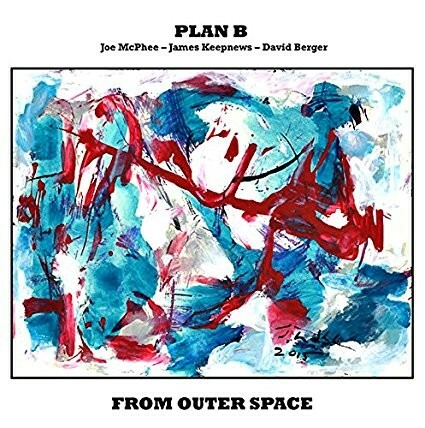 Plan B puts this master in the orbit of two other highly evolved improvisers: guitarist and laptopper (and Chronogram contributor) James Keepnews, a fellow Poughkeepsian; and Beacon drummer David Berger (Amy Helm, Byron Isaacs). Alongside the titular interstellar theme, a Coltrane-esque spiritual yearning permeates the proceedings, which occasionally find McPhee on pocket trumpet. Keepnews colors the cracks with treated guitar, digital squelches, and piano samples. Berger bounces between animated outbursts and distant hints of Dixieland grounding. Like Ra said, space is the place. Your ride’s here. Roaratorio.com.